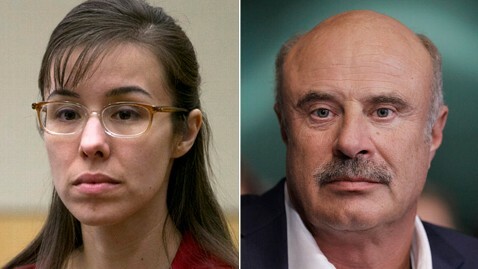 Television therapist Phil McGraw today denied an accusation that he paid money to the family of accused murderer Jodi Arias in exchange for interviews after her trial ends. The allegation that McGraw paid Arias' parents or other family members came from a blogger, Chris Stark, who has written extensively online about the Arias trial and, before that, the Casey Anthony trial. "Dr Phil Production Company is paying for # JodiArias Family to attend Trial via paying MOM Sandra for her daily NOTES she writes," Stark Tweeted Friday. Arias is the subject of a high-profile murder trial in Phoenix, Ariz., that could result in the death penalty if she is found guilty of murdering her ex-boyfriend, Travis Alexander. Her mother, Sandra, has attended each day of the trial. McGraw responded on his Twitter account over the weekend, saying he is not paying the family. "Rumors that we're paying for Arias family housing etc… are absolutely untrue. I've never met the Arias family, and neither I, nor my …… production company - has paid or promised them anything. Robin and I are praying for the Alexander family,' he wrote in two Twitter messages today. McGraw's production company said there had not been any arrangements for "hotel rooms or licensing of any sort." Arias' father, Bill, said the family was not "doing anything with Dr. Phil," although he declined to elaborate. Arias' mother did not immediately respond to requests for comment. She has sat in the front row of the court's gallery for the duration of the trial, which began in January. ABC News has been unable to reach blogger Stark.